Korean chamber to be set up in India's Tagore Museum. March. 22, 2019 08:15. chan2@donga.com. The first Korean chamber will be installed in the museum of the legendary poet Rabindranath Tagore (1861-1941) in Kolkata, eastern India. According to the Korean Cultural Service, the Tagore museum announced that it will open a Korean room as early as at the end of this year. This marks the first time that a Korean exhibition space has been officially set up in any major museum or at memorial in India. 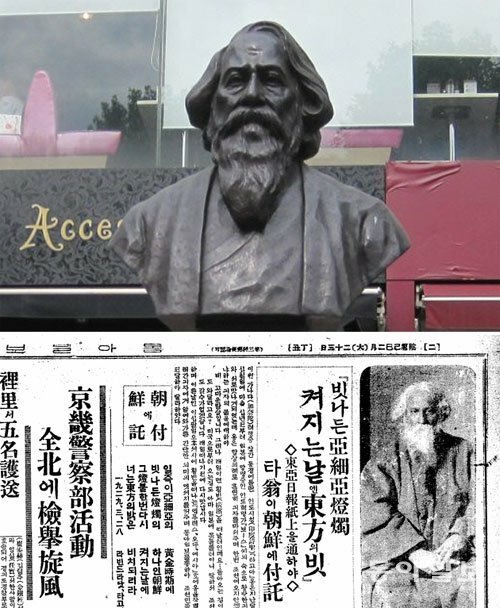 Tagore expressed deep affection for Joseon, describing it as "bright light in the East" in his poem "The Shining Lamp Light in Asia," which he contributed to the Dong-A Ilbo on April 2, 1929, during the Japanese colonial period. This poem, written in English, appeared on the papers, translated by Joo Yo-han, the then Dong-A’s chief editorial chief. The Korean chamber at the Tagore Museum will display publications on the Indian poet as well as materials on the history and developments of Korea. A copy of the Dong-A Ilbo's page with the "The Shining Lamp Light in Asia," textbooks, the Korean translation of Tagore’s “Gitan Zali,” and Korean books on Tagore will also be displayed at the chamber. The exhibition plan also includes exhibitions about the culture, exchange, and history between Korea and India such as the tales about Hwang Huang-ok, a princess of India, who married Kim Suk-ro, king of Garak province, and Hyecho, the Buddhist monk from Silla known for his travelogue Wangocheonchukgukjeon. The museum also plans to show various materials providing a glimpse into the developments of South Korea since it was liberated from Japan’s colonial rule. The ambition is to show the process of South Korea having grown into the “Bright Light of the East” as depicted by Tagore.